Although relatively small, Scotland is a land rich in contrasts. Often within a few hours easy travelling, you can experience a landscape that changes rapidly from gentle rolling hills to rugged coasts and dramatic, towering peaks. Elsewhere, you'll discover vibrant, dynamic cities and towns whose outlook is definitely to the future rubbing shoulders with Scottish ancient castles and monuments rooted firmly in the past. But if the cosmopolitan pace gets too much, you're never far from the peace and tranquillity of sandy beaches, country parks and outstanding nature reserves. In fact, the only constant is the warmth of the welcome you'll receive wherever you go! 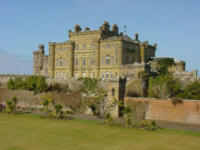 And for such a compact country, Scotland offers an amazing variety of things to do and see. Its cities are all modern, dynamic and thriving centres, each with a distinctive character of its own but which all guarantee their visitors a vibrant mix of history, culture and entertainment, stirred together with some of the best retail therapy in the UK! Scotland also boasts a year-round calendar of events that cater for every enthusiasm: art, music, food and drink, history, sport to name but a few - in fact, if they can think of a reason to gather like-minded individuals together, the Scots will celebrate it and invite their visitors to join them! Whatever your reason for visiting these pages, be it that you are considering a vacation, holiday or are simply looking for information, then hopefully you will find it here. If there is any information you would like to see on these pages, then feel free to e-mail the webmaster who is an actual resident of Scotland. exploring the spooky and bizarre side of Scotlands Capital. 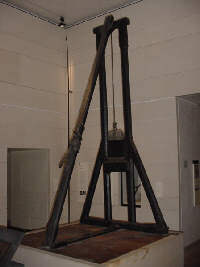 The picture is of the Scottish version of the guillotine. June & July highlights the Show gardens at the National Garden and Flower show.